I have been drifting in and out of consciousness on the plane — so that, when I open my eyes fully, I have lost track of the exact progress of the journey. Yet it takes only a second for my internal GPS to retrieve my coordinates — because there is something immediately recognisable about coming in to land at Aqaba. It is the shape of the water at this juncture — that easterly finger of the upper Red Sea, poking between the hard shoulders of Egypt and Saudi Arabia, and reaching its cul-de-sac where Israel and Jordan meet at the waves’ edge. I can see the geography clearly as we descend, the land flinty and serrated, a parched grey-brown; the liquid chasm alongside silver-blue in its salinity — sundering Africa from the Middle East, as in biblical days. I could not be anywhere else. Of course, any traveller could be forgiven a case of mistaken identity. While Egyptian resorts on the main body of the Red Sea — such as those at Hurghada and Marsa Alam — are currently reachable, those to the north-east have tumbled into an exclusion zone. Travel advisories recommending against all but essential travel to the Sinai Peninsula currently rule out getaways to Taba and Dahab. And while, technically, Sharm el-Sheikh is not off limits, concerns about security at its airport abound, following the crash of a Russian airliner shortly after take-off in October 2015. 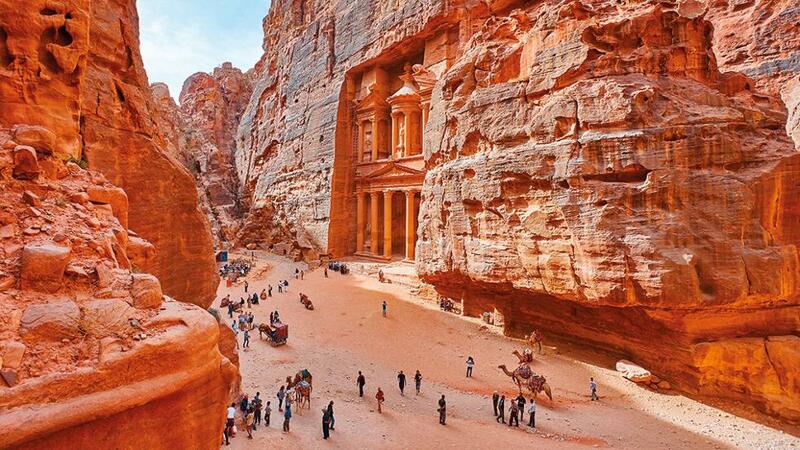 Jordan is often considered one of the most stable states in the Middle East, but there is also a fair argument that it is also one of the most alluring to visitors — awash with history that pre-dates the Romans, and hewn from a landscape that rears to craggy peaks while plunging to salt-crystal depths. And besides direct touchdown for flights from Dubai to the capital Amman, in the north-west, services to Jordan’s southern hemline such as Aqaba is also aplenty. 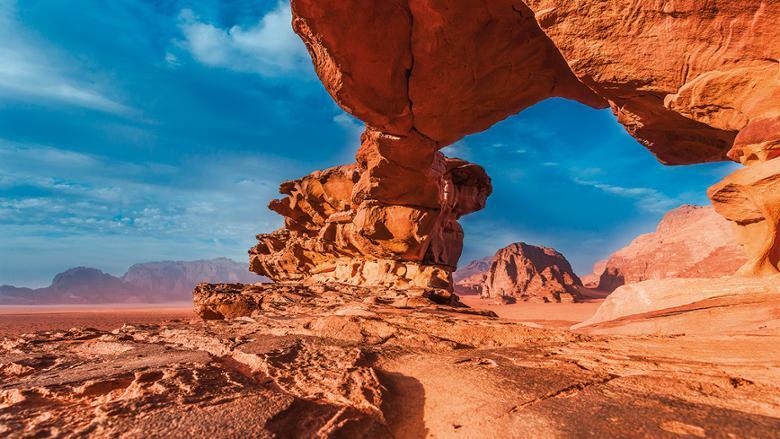 This has helped bring two of its most fabled attractions, the ancient Nabataean city of Petra and the low desert of Wadi Rum, to within tantalising proximity — long weekend territory no less. 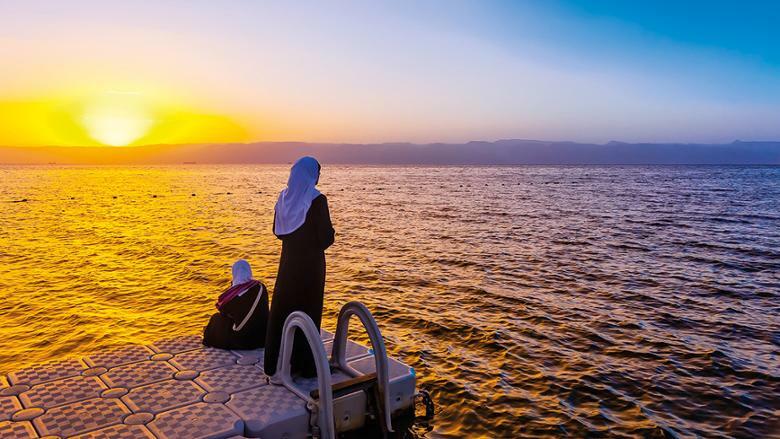 Jordan boasts just 27km of Red Sea coast, but Aqaba is increasingly making the most of the space. Literally, in the case of Ayla, an under-construction complex of marina moorings, luxury condominiums, golf greens and beachside sunloungers. 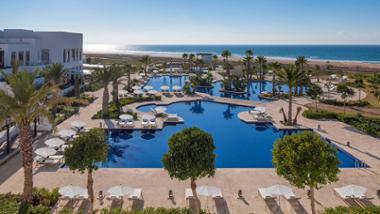 There are new hotels aplenty, too — such as the Al Manara, which opened on the seafront in July, its 208 rooms and suites gazing at a lagoon carved from the shore as a rippling backdrop. Those who go to the city, chasing little more than a sun that holds its nerve at 20C in December, will find all the indolence they need in such oases — although there are distractions beyond the walls. At the dock, boat operators offer snorkelling trips, fish fluttering at your fingertips. At the Aqaba Museum, artefacts including Bronze Age pottery and a milestone from the Via Traiana Nova (a Roman road to Syria that began in the city) drag the local tale back through the centuries. The museum is a reminder that, for all the modernity of hotel infinity pools, the past is rarely invisible in a country that revels in heat haze on the highway, and dust in the air. Certainly, yesteryear feels closer as I go 65km east. The Red Sea recedes, Aqaba fades, and Wadi Rum opens its pink and orange arms. The desiccated valley where T E Lawrence slipped impishly around Ottoman defences during the Arab Revolt of 1916-18, and which generations of Bedouin nomads have called home, makes no attempt to conceal its age – its coxcombs of granite jutting up like sinking ships in an ocean of sand. I am, though, briefly confused as to my location — as Sun City Camp seems to believe it is on another planet. At the bottom of a shallow slope, 15 globular ‘Martian Domes’ face the wadi (valley). Inside, all is comfort — soft beds, en suite bathrooms, transparent ‘walls’ that display the view beyond. But from outside, the ‘tents’ resemble sealed pods, protecting their inhabitants from an oxygen-free void on another fragment of the galaxy. The impression is, of course, deliberate. 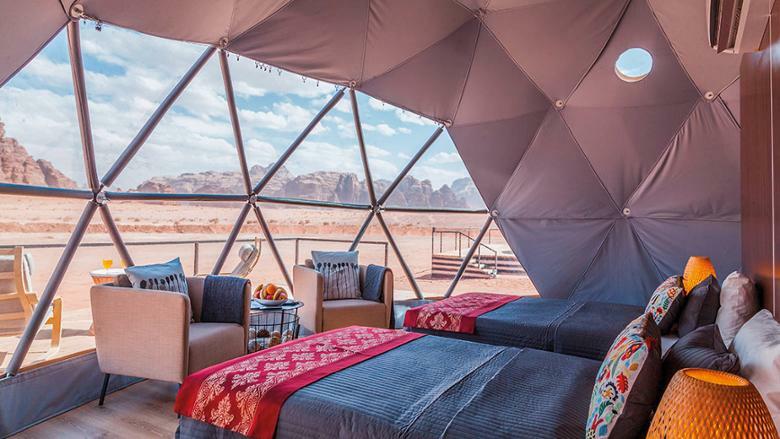 The Martian — the 2015 science fiction epic starring Matt Damon as a stranded astronaut, which garnered seven Oscar nominations — was partially filmed in Wadi Rum, and the camp has been quick to make good the association. This clever conceit only vaguely diverts my attention from the main event. Sun City offers four-wheel drive forays into the valley — in time for sunset, and, for those who can countenance a 5am alarm call, for sunrise. The two excursions are curiously different. In the evening, it feels as though the vehicle is losing a race with the shadows, which lengthen at a prodigious rate — the sun throwing itself below the horizon, then painting the firmament an eerie shade of tangerine. 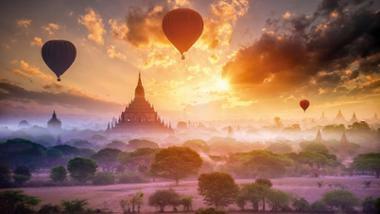 At first light, it returns invigorated, the sky to the east a fervent fire-yellow, the desert darkness retreating. The chill that swaddles the night in Wadi Rum is slower to leave — and I am grateful for the coffee, heavy with cardamom, warmed on an open fire by Bedouin hands that do not fear the flames. The same sun is on its midday plinth when I arrive at a Petra that is barely less known than our solar guardian. The citadel cut from sandstone by the ingenuity of the Nabataean civilisation is more of a celebrity now than when established in the fourth century BC. Its fame is enshrined in a lone structure, the six-pillared Al-Khazneh, which hovers silently at the end of the Siq (the passageway between soaring cliffs that channels visitors into the site). Its name, translating as ‘The Treasury’, is also indication that Petra is only semi-appreciated. The citadel’s Instagram landmark was not a place of money storage, but a tomb for a first-century AD Nabataean king, Aretas IV. This misunderstanding is emblematic of many visitors’ experiences of the site — a swift selfie with the star attraction and a return to the tour bus, missing many of the wonders of a ‘lost city’ whose one-time size only reveals itself if you explore on foot. In some ways, it is the tiny subtleties, often unnoticed, that show off the Petra that once was — traces of a Roman arch that was added to the Siq after Trajan’s conquest of the Nabataean kingdom in AD 107 (which proved less immune to the rumblings of time than the indigenous constructions); the remnants, in the same thin corridor, of a sculpted camel train, now reduced to the disembodied feet of merchant and animals, trotting into the city. In other ways, it is the showpieces beyond Al-Khazneh that detail what a mighty settlement it must have been — the Nabataean Great Temple, piled high in the first century BC and still towering above the paved Roman street; the adjacent Qasr Al-Bint Al-Faroun temple, conceived in the same epoch, and probably dedicated to the main Nabataean deity, Dushara; the shell of a sixth-century Byzantine church, its floor adorned with mosaics of birds and donkeys. It would be easy to view Petra as a dead relic. But the citadel lives and breathes, swirling with Bedouin traders who see themselves as the Nabateans’ heirs — and who, although residents were settled into a new village when the site gained Unesco status in 1985, fill its lanes with shouted serenades, touting horse and camel taxis, outnumbering tourists. Those seeking Petra in 2019 may not wish to immerse themselves so utterly. But they may find that its spell is as seductive as ever. Amman: Jordan’s capital shows its history in the Greco-Roman Temple of Hercules, which crowns the Jabal Al Qal’a hilltop; and the colossal Roman amphitheatre that haunts downtown district Al-Balad. It shows culinary flair, too, in the eateries of Al-Rainbow Street. Sufra (romero-jordan.com/sufra.html) serves lamb mansaf in a former Ottoman town house. 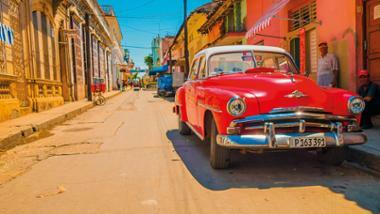 A one-night stay at the Hotel Kempinski costs about Dh530. 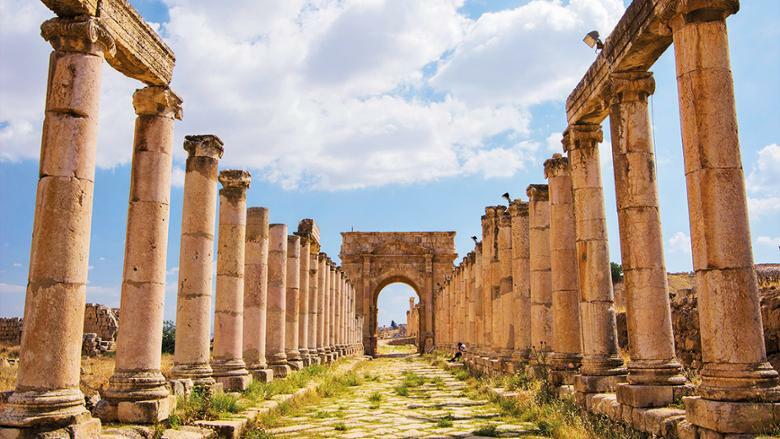 Jerash: Arguably the greatest Roman city outside Italy, Jerash shines 48km north of Amman. The Oval Forum at its heart is a miracle of antiquity, framed by two grand curving colonnades, while the Arch of Hadrian at the entrance looks as magnificent now as it did when built to greet the emperor in question in AD 129. The Dead Sea: About 55km south-west of Amman, the Jordanian portion of the deepest hypersaline lake on the planet is a magnet for resorts dealing in spa treatments and mornings afloat in the viscous water. The five-star Kempinski Hotel Ishtar offers a raft of swimming pools with lake views and doubles from about Dh700 a night (kempinski.com/en/dead-sea-hotel-ishtar). Getting there: Fly Royal Jordanian from Abu Dhabi to Aqaba with a layover at Amman, from about Dh1,300 return. Staying there: Al Manara hotel, Aqaba (00962 3 202 1000; marriott.co.uk). Doubles from about Dh595. Sun City Camp, Wadi Rum (00962 7 9566 6673; suncitycamp.com). Double tents from about Dh655. Petra Guest House, Petra (00962 3 215 6266; guesthouse-petra.com). Doubles from about Dh290. 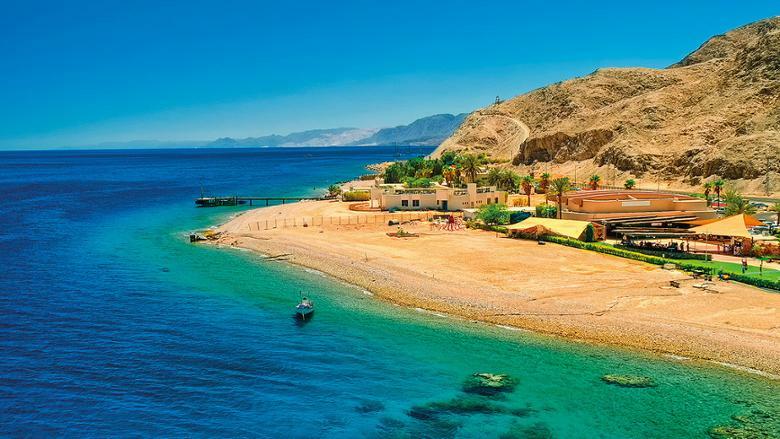 Touring there: Sea Guard (00962 3 201 6905; c-guard.net) runs snorkelling trips in Aqaba from 40 Dinar (about Dh205). For more info visitjordan.com.